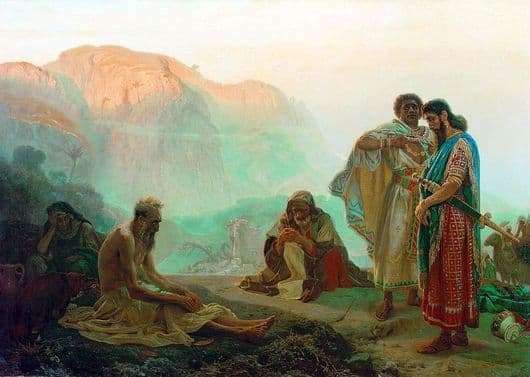 Ilya Efimovich Repin created the work “Job and his friends” in the period of receiving the title of free artist – it was 1869. At the core of the writing of the masterpiece is a story from the Old Testament. A martyr named Job appeared before people, a man who received a great deal of pain and suffering. He was left without a family family, lost property, turned into an old man who is sick. His friends came to visit Job, they are horrified by what happened to Job. The plot composition of the meeting of Job and friends is fully visible on the canvas of the picture, all the emotions of the images are reflected in the striking perspective of reality. The palette of colors of Ilya Efimovich surprised critics and observers of his work. The image of the main character – Job, his heartbroken wife, and friends who were of different nationalities. The main requirement of the Academy of Arts was the mandatory execution of the details of the entourage, historical events and images of human figures. Ilya Repin transcends this framework, and the work “Job and His Friends” becomes a real masterpiece of Christian subject painting. Cloud haze in the picture is painted in warm colors, it seems that it is morning. The liberty performed by the images of Job and his wife proved real tragedy and sadness. The artist wants to reach out to kind people, he asks for help as the main character of his picture. Epic properties of the work slip between the figures of Job and friends. We do not see tears, but we feel this fear and horror when you are sick and alone. The decision of the artist to use such a view of composition was the first step to the success of drawing in this style. Ilya Efimovich Repin has always distinguished himself by his breadth of interests and responsive talent. This painter has become a teacher for many famous people. He could convey all the feelings through transitions in the pictures – this is a gift that you simply can not take away. The artist traveled a lot, but at the end of his work he returned to Russia. Native country gave him a feeling of warmth and goodness in the field of painting, and awareness of internal human values.